This is the last article that I will be submitting from Texas as we will be heading for San Diego via New Mexico and Arizona next week. I hope to send one article from one of these states, if not, there will definitely be one from California. The recent sighting of a rare Black Vented Oriole in our area provided me with a topic for this week. As I stated last week I wanted to cover some rare birds in a future article and this is it. In fact I will cover two rarities, the Audubon’s Oriole and the Black Vented Oriole, that occasionally stray north of Mexico with the latter being much rarer of the two. The robin-sized Audubon’s Oriole is similar in markings to our Baltimore Oriole but the orange has more of a yellowish tinge to it. The only place where it can be seen with any regularity is at the little town of Salineno near Falcon Lake in Texas. One has to go to a private campsite to see this oriole but the residents are very hospitable and, for a small donation for bird food, visitors are welcome and even have chairs provided for comfortable viewing. The smaller Black Vented Oriole looks very similar to our Baltimore Oriole and a casual observer would probably assume it to be a Baltimore. The overall distinguishing field mark is the extensive amount of black on the upper back, wings and tail of the Black Vented. The tail of the Baltimore has a lot of orange in it while the Black Vented has an all black tail with the black extending upward to the vent (hence it name); the Baltimore’s wings have white bars while the Black Vented has all black wings; the black on the Black Vented Oriole comes down over the shoulders while the black on the Baltimore is much narrower. 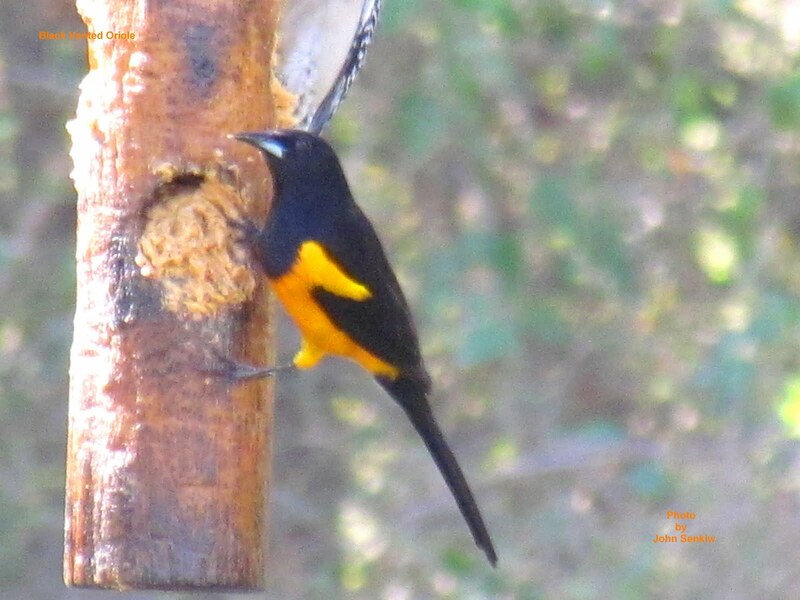 In a nutshell, the Baltimore is an orange and black oriole; the Black Vented is a black and orange oriole. The contrast between the black and orange on the Black Vented is much more striking than on the Baltimore. 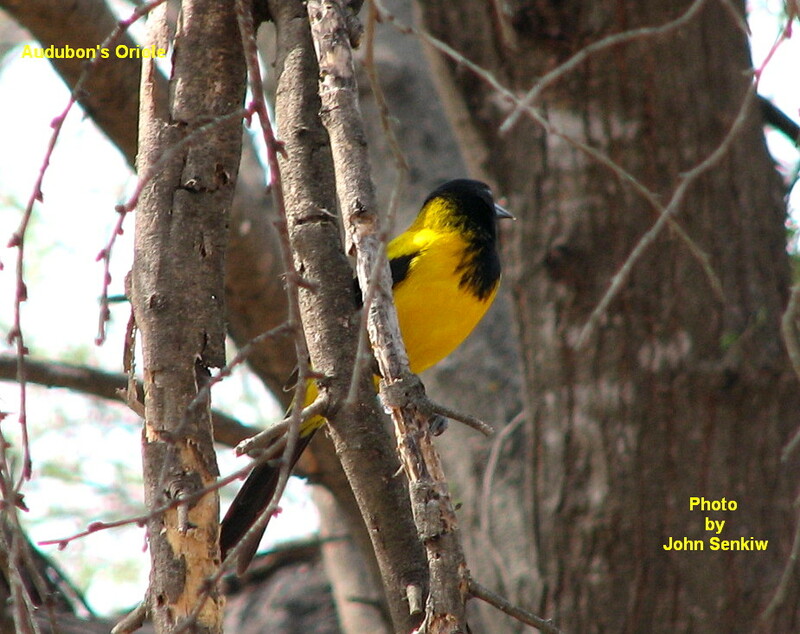 The picture of the Audubon’s Oriole was taken five years ago at Salineno, TX. 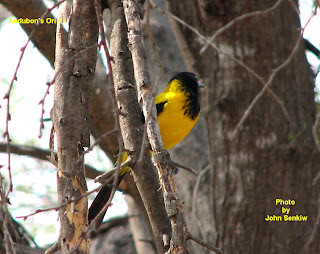 The photo of the Black Vented Oriole was shot at the Bentson State Park just several weeks ago. Unlike the Audubon’s the occurrence of the Black Vented is random and sporadic.